Raya Babaeva says she's neither Azerbaijani nor Armenian. She's Karabakhtsi. STEPANAKERT, NKR -- When Raya Babaeva appears in the newsroom of Artsakh Public TV and Radio her colleagues become enthusiastic and sincerely greet her saying "Hi, Raya jan, where have you been, we missed you." Say hello to Raya Babaeva, an Azerbaijani woman who lives in Stepanakert, the capital of Nagorno-Karabakh, ground zero for hatred between Azeris and Karabakhis. Despite the war between Armenians and Azerbaijanis Raya found enough courage not to leave Karabakh and nowadays enjoys the love and respect of Armenians around. "When people ask me if I attribute myself as Azerbaijani or Armenian I reply that I am a Karabakhtsi," she says smiling. For Raya, 57, the line between Armenian and Azeri disappeared in 1966, when she married Karabakh Armenian Ararat Grigoryan. During Soviet times marriages between Armenians and Azerbaijanis were not common and desirable but not unique either. Besides causing thousands of deaths on both sides, the 1990-1994 war in Karabakh affected the families of mixed marriages. Some families left for Russia or other countries; some divorced, with Azeris leaving for Azerbaijan and Armenians for Armenia. Raya said that during the years of war she was never thinking about leaving Karabakh to live far from her Armenian husband and two children. She was ready to stay in Karabakh until the conflict ended and was even ready to stay until being deported. "It was a hard time for me. 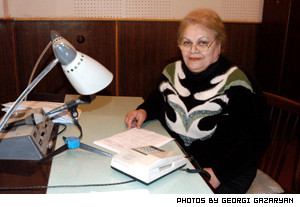 Azerbaijanis and Armenians were killing each other, and each death hurt me," Babaeva says. However she says she was never afraid of being killed by those who knew she was Azeri. Neighbors treated her as they did before and no one cursed her for being Azerbaijani. "Once my Armenian friend who came to visit me told me 'I want to take a weapon and go to fight Azeris'. I told her 'Kill me, I am one of them'. She looked at me, then hugged me, cried and said 'How can you say that?' I was crying too. That was for the first time I realized the cruelty of war," Babaeva recalls. The Armenian husband and Azeri wife were ready to share all difficulties together and never blame each other for being either Armenian or Azerbaijani. However the war did not spare the family. Raya's husband Ararat was killed in 1992 when he happened into a street that was under fire from the Azeris. After Ararat's death Raya realized that it was not only her husband that kept her in Karabakh. "I lived here for more than 30 years and didn't want another home. Armenians accept me as their own and I have no reason to feel isolated. And I thank a lot both authorities and people who gave me the chance to live here as I lived here before," she says. Raya's job at Artsakh Public TV and Radio gives her a chance not to forget her mother tongue. She reads the news on "The Voice of Justice", which broadcasts on 31st short wave's channel in Azerbaijani language for Azerbaijan. "We consider this program as a cultural bridge between Karabakh and Azerbaijan. We tell the news about Karabakh, the political analysis and diplomatic talk about the possible settlement of the conflict. If there are Azerbaijani captives we interview them and their parents can hear from them that they are alive," Raya says. She believes that the conflict can be over soon, but only if Azerbaijan recognizes the independence of Karabakh. "I hope one day Azerbaijanis can come to Karabakh and Armenians can go to Baku," she says. "The conflict can not be resolved completely unless people have a chance to freely cross borders." Her colleague Larisa Grigoryan describes Raya as a devoted friend, kind and sincere. "I am a patriot and to some extent a nationalist," Larisa says. "But I don't see the reason why I should hate Raya. It is not her fault that her people turned out to be so hostile. I see no difference between her and my Armenian friends." As for Raya she says she has two Gods: One she had when she was born into her Azerbaijani family and other when she was baptized in 1985 in Echmiadzin. "When I bathe my grandchildren I pour water on them and make by palm a cross over their heads saying 'God bless you' as it is accepted in Karabakh," she says. "When I hear news from Azerbaijan my heart jumps and the feelings burst into me. I love my Azerbaijani people and I will love them till the end of my days. And I love Armenian people because whatever good I had in my life was Armenian." There are more Azeris who live in Karabakh; some of them changed their names, others live in villages and their life is not public. Raya is well known in Stepanakert and if you ask passersby if they know any Azeris in Stepanakert many would tell "Meet Raya, she is a very good person."